Kenny Rogers ROASTERS (KRR) has received overwhelming demand for their OMG Chicken (the only unfried fried chicken in Malaysia) from guests. 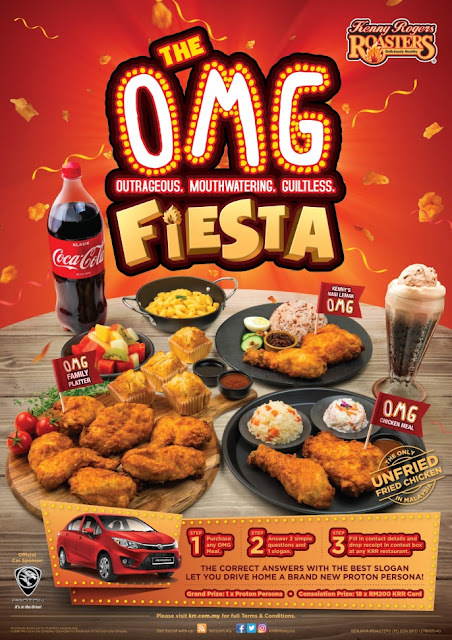 In response, KRR has launched the OMG Fiesta campaign happening from 1 August to 28 October in conjunction with the Merdeka celebrations. For every purchase of the OMG meal, guests will be asked to answer 2 simple questions as well as create 1 slogan to be placed into a contest box in any KRR restaurants. Guests with the correct answers and best slogan will stand a chance to win a brand new Proton Persona 1.6 Premium CVT or 18 x KRR cards with RM 200 credit preloaded.